National Association of Teachers of Singing - Spring 2014 Inter Nos: Independent teachers, Boston and more! 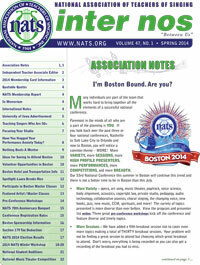 What's New > Spring 2014 Inter Nos: Independent teachers, Boston and more! Spring 2014 Inter Nos: Independent teachers, Boston and more! The Spring 2014 issue of the Inter Nos newsletter has been released by the NATS National Office. We hope you enjoy this issue and the many important topics it spotlights. From focusing your studio, to teaching singers who are 50+, to handling performance anxiety, to the importance of mentoring, Associate Editor Nancy Bos has compiled important information to aid singing teachers and other music professionals. In addition, many details are presented about the exciting 53rd NATS National Conference, which will be held in Boston this summer. We hope to see you there! Turn pages by using the arrows on the left and right of the screen, by using the table of contents on page 1, or by using the tool bar at the top of the screen. Increase the size of the text by clicking in the center of the display window. To decrease the size of the text, click again. Or use the tool bar at the top of the page to scroll, zoom or go full screen. All areas of the document that feature interactive content - such as links to important Web pages, or interesting videos - will be highlighted in blue, making it easier to spot them on the pages. Moving your cursor outside of the document frame will make the blue display areas disappear. Downloading the newsletter for printing or display on another device is simple. Just look for the link at the bottom of each even-number page - and click. The document can also be downloaded by clicking the "share" icon in the tool bar at the top of the page. (requires your member login and password).